I can still hear you saying you would never break the chain. It’s true. Even more important than your mouthwatering recipe; more vital than your witty party banter; of higher value than your Bon Appetit-worthy snaps. The Links Are All. The Virtual Vegan Potluck is no more than a glorified blog circle with a bad case of veganus blogus giganticusitis. Without the correct links between one blog and the next, our Dear Readers will be stuck in Appetizers, or Side Dishes or Soups or somewhere else. He or She is dying to see what’s in Breads or Salads or Desserts, but there they are, trapped in the 7-layer dip. So, please, make sure you’ve got the correct links and that they work. Here’s the good news: Links Are Easy. It’s as simple as inserting an image into your post and then pasting a URL into the appropriate spot. 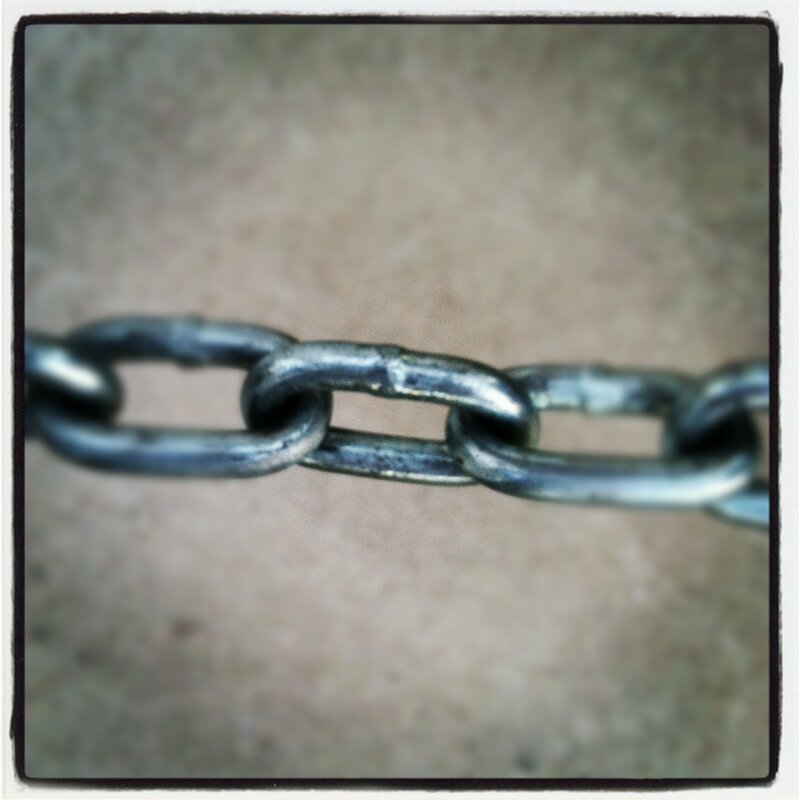 (Blogger bloggers, you’ll be doing an even simpler method of linking within your text.) I’ve detailed the How Tos and What Fors below. This exact same information is also available on the Virtual Vegan Potluck website under How It Works. If you have any questions, you can contact me via the VVP website in the Contact form. The second VVP update will be published October 24 and will be about time zones, when to schedule your posts and how to schedule them in WordPress and Blogger. Oh – and a quick and heartfelt thanks for all of the AURV blog birthday wishes! Pretty cool having two birthdays a year, huh? 8) Next to where it says Link URL you’ll see the URL for the photo. Delete this and insert the URL for the blog that precedes yours in the Potluck (i.e., www.nonexistentveganblog.com). FYI: To have a new window open when a reader clicks the button/image, first click on the image. You’ll see the little photo icon and the delete icon. Click the photo icon. This takes you to the Edit Image window. Go to the Advanced Settings tab and scroll down to the bottom. You’ll see Target then the words, Open Link in a New Window. Click the box to place a check mark in it. Click Update. Apologies, Blogger bloggers. The method that I used for the last Potluck is not working for me this time around, so please just use the Linking within Text method described above – unless you are way savvier than I in Blogger. Once more, with feeling: It’s essential once the Potluck is live that you update your links so that they go to the actual posts rather than to the blogs in general. Once the Potluck is over, readers will be able to go from one VVP post to the next without having to search through your blog. Make sense? Oh, and remember, no animal products should make an appearance in any of your Potluck dishes! Thank you! My pleasure! That’s what this event is all about – meeting and greeting (and eating)! I got my big girl pants on :-)! Thanks, Tiffany – I worried about that! I figured it out last time..I have faith I’ll figure it out again!! Thanks for the step by step cheat sheet! Can’t wait to drool all over my keyboard. Like riding a bike! Like cranking out another half marathon! Do you remember that Monty Python bit about drool cups? I think it was Monty Python… Anyway, maybe we should patent and sell VVP Drool Cups?! Same – I had my worries as a techno-phobe, but I did it. Bring on the drooling! Lots of work you are putting in to making this wonderful event possible! Thank you so much! All fun, Anne, all fun ;-)! Look forward to seeing all the dishes my friend! Hehe – you’re probably relieved not to have to mess with this stuff ;-)! I feel the same about you, dear!! I understand about inserting the links and timing and all that but I’m wondering – do we get a list of the order of blogs so we know who we’re supposed to link to as far as previous/next blog? I’m getting my post prepared today and hope to be able to have it all ready to go when the time comes. PS I’m the blog ahead of yours :-). I understand crazy-busy! Let me know if I can help in any other way.